Fan: n. An enthusiastic devotee, follower, or admirer of a sport, pastime, celebrity, etc. Origin: 1885-90, Americanism; short for fanatic. Hmmm. Interesting that its origin is American. No wonder Canadian hockey fans are so terrible. We’re all fans of something. 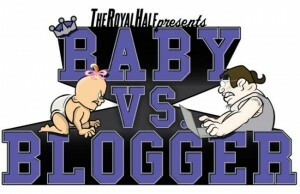 And as evidenced by your visit to this prestigious blog, we’re all fans of the Kings. 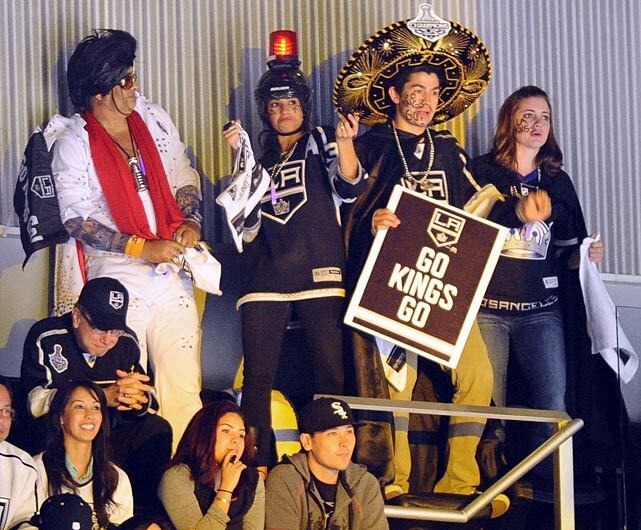 But what kind of Kings fan are you? What kind of Kings fan am I? What kind of Kings fan is the angry, drunk, knockoff-jersey-wearing, doesn’t-know-the-effing-rules-but-still-screams-at-Sutter-from-the-rafters guy (or, heaven help us, girl)? After conducting exactly zero interviews and collecting no quantifiable data to justify my conclusions, I’ve compiled an official list of hockey fan designations and provided what I believe to be a thorough textual/visual definition of each. Consider this part of The Royal Half Hockey Encyclopedia that will be available to check out from your local library in CD-ROM form next year. I’ll leave it to you to decide which fan you are. 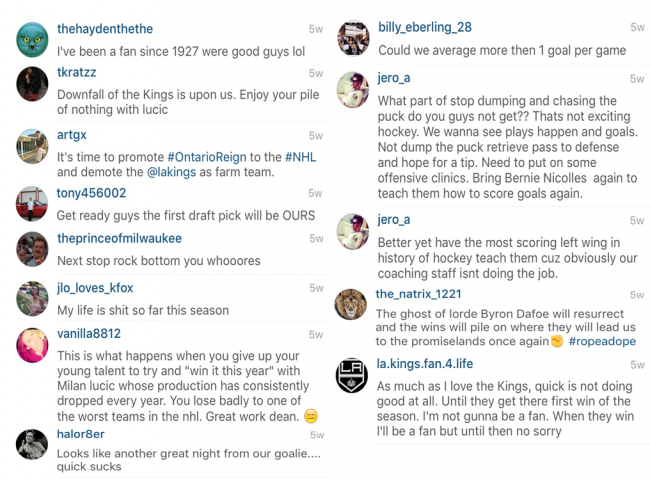 But keep in mind, sometimes our fandom drives us to do weird stuff – like comment on a team’s unmonitored Instagram account 3 games into the season – so don’t be ashamed should you discover that who you are on the streets ain’t who you are in the Staples Center seats. You’ll notice that I did not include the Bandwagon fan on my list for two reasons. One, I hate the term ‘bandwagon’ and two, I hate listening to people posture on about what it means to be a bandwagoner. We all know. ‘Nuff said. Anyway, enjoy the list. Let me know if you have any suggestions and be sure to send me word once you’ve attained enlightenment and discovered who you really are. Though we’re using the word ‘marriage’ loosely here because Fan-by-Romantic-Relationship is dumb, the Fan-by-Marriage fulfills his/her role admirably. The Raging Bull is the guy who used to scream at Dustin Penner for being a “LAZY, OUT OF SHAPE FATASS” while stuffing his face with hot dogs, Popcornopolis and beer. The Raging Bull is the guy at the game with his Raging Bull girlfriend. He has gauged ears, a flat-brimmed hat and wears a jersey he bought at a swap meet in Norwalk. She’s squeezed herself into a DIY Kings dress with horribly unsuitable heels and has a Kings tattoo on her lower back. He shouts “F*** the Ducks!” over and over again while she barks at the ref for being a blind SOB. They keep the passion alive by picking fights with everyone around them, even the dad of two who politely asks them to stop swearing in front of his children. The Raging Bull will yell anything at anyone. He will throw things. He will honk his horn at the car in front of him that is yielding to a blind man in the crosswalk. He perspires more than any of the players on the ice and his resting blood pressure hovers at a steady 163. Do you really want to hurt me, Raging Bull? If you’ve never watched Flight of the Conchords (you NEED to), you may not understand the reference. The Mel is creepily devoted. The Mel has a closet full of tchotchke from every Kings game he’s ever attended. The Mel would dig through Jeff Carter’s trashcan at night could she only find the address. The Mel says things publicly that are unnerving. Lick it and find out. RT @oneA_twoRs_45: Does ANYONE know what Matt Greene's thigh tattoo is? I'm so curious. LA Kings announced that Alec Martinez has been cleared for contact. Baby, you have always been cleared for contact with me. The Mini Mel is a subgroup of The Mel because they are Mels in the making. Mini Mels are all under the age of 18 and yeah, it’s soooo cute when they freak out a little bit upon seeing/meeting/watching their favorite hockey player. But trust me, if they continue down this road, things will get weird and I don’t want to be the one who has to explain why breaking into Justin Beibers’s house and taking a nap in his bed is against the law. A Portland Trailblazers fan once told me, “Every season I hope for the best but prepare for the worst. I can’t ever be truly happy during a season because we’re a franchise that drafts Sam Bowie over Michael Jordan. It’s ALL bad.” Though the Fatalist spends ample time preparing himself for the worst, when it finally happens, nothing can assuage his anguish. Like an attorney, the Fatalist uses precedent as a means to justify his apprehension. If his team has blown a lead once before, the Fatalist has all the evidence he needs to expect them to blow every lead they’ll ever hold in the foreseeable future. If his team lets in an early goal, his entire game experience is tainted. Should his favorite player offend the rules of the game and obtain a penalty, the resultant meltdown is legendary. I have it on good authority that the phrase “sudden death” was attached to a period of overtime by a Fatalist. For the Fatalist, hockey is an abusive lover. And though it has tortured him for years, like Stella in A Streetcar Named Desire, he can’t help but go back when Marlon Brando bellows his name from the ice. Note: The lack of gifs, videos and pictures representing the Fatalist is symbolic of his lonely and bitter existence. The Braveheart wears his devotion on his sleeve, face, body, car – any surface that can be branded, is. They’re bleeding heart optimists and so devoted to the quest for victory that it’s almost guaranteed they’ll meet their demise by it one day. The Braveheart champions himself a martyr in pumping up the crowd, even if he misses some of the action. He brings a lighthearted thrill to the in-game experience, reminding all of us pretentious Angelenos that it’s perfectly okay to be goofy sometimes. The Braveheart is here to party. He dresses up. He makes signs. He fears nothing. He hides nothing; even if it’s at the expense of his companion. The alpha and omega of his commitment goes beyond Figueroa and Chick Hearn. There is no one more superstitious, more calculated in her behavior (especially on game day) than the Raven. She knows that one wrong move could blow the entire season. #NeverForget when my brother moved overseas last year & I stole his unlucky Kings hat to wear to the home-opener & jinxed the entire season. The Raven knows the difference between irony and coincidence but rejects both outright. Everything happens for a reason, she declares, and like the lore of her feathered namesake, she has a reputation for identifying the root of deep mysteries. The LA Kings are 0-2 without Roland McKeown in the organization. I tried to warn you guys about that Taylor Swift banner. @CarrlynBathe The Kings lost b/c it was the 13th game, Clifford had a fight & the Taylor Swift banner was there… #13. Superstitions, man. 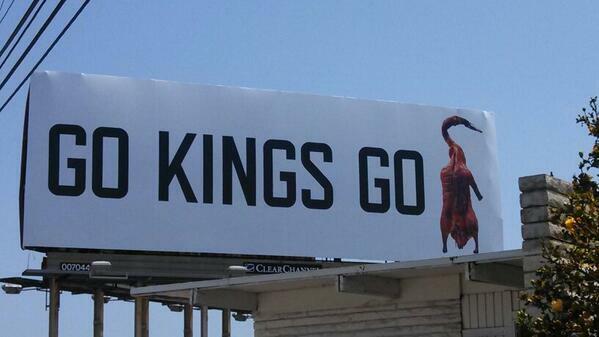 So is Staples Center going to take down that Taylor Swift banner or are the Kings going to go 0-82? The New guy is new to the game, he knows it, and he’s hanging out anyway. The New Guy doesn’t show up to the party with Opus One because he grew up drinking boxed wine. He’s on board to refine his pallet though and isn’t embarrassed that he’ll need your help along the way. Sure, he leans over and asks you to explain icing. And like, of course he makes a comment about having a hard time following the puck. He may even pronounce the L’s in ‘Robitaille’. But he’s happy to be there and is grateful to have a new LA-based team to root for since he’s already mourning Kobe’s forthcoming forced retirement. The Lifer can be one of two people. The first is the Lifer who has been around since the Butch Goring days. This Lifer is grateful that the Kings finally won the Cup and goes to bed every night humbly thanking the cosmos that hockey is taking root in California. Then there’s the “We Heard You, Bro” Lifer. He’s been around since the late ’80s and likes to remind all fans born after 1993 that they don’t know suffering. 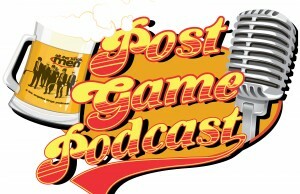 These Lifers survived the collateral damage of the McSorley stick incident and the Kings’ failed Cup run of ’93. They also survived the years-long deterioration of the Kings’ performance during the late ’90s. 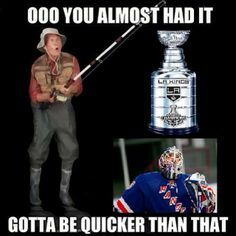 @LAKings i dont care if the @LAKings go 0-80, i still be a kings fan next season, like i have every season since '88. These Lifers know a lot about their chosen team, and they know a lot about every other team in the NHL as well. They worship Dean Lombardi like he’s Baal and remind plebeians all over the world that they alone knew the reasons Jonathan Quick started over Ryan Miller during the Olympics. Remember when people thought Ryan Miller should start ahead of Jonathan Quick in the Olympics? That was fun. 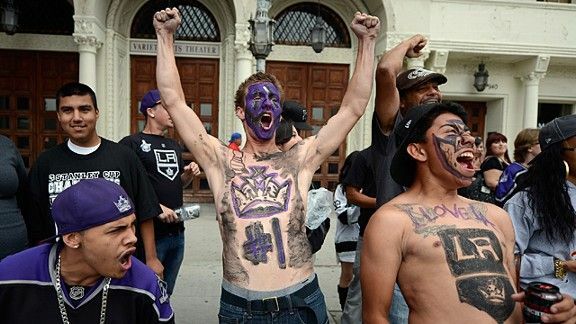 Though they’re the tried and true self-proclaimed Patriarchs and Matriarchs of Los Angeles hockeydom – and undoubtedly deserve our respect – we’ll all be thrilled when they stop demanding that everyone show their hockey credentials upon entering Staples Center. For a list of some prominent “We Heard You, Bro” Lifers, click here. If you’re new to the internet, meet the Troll. He is everywhere. He’s aggressive but his bark is bigger than his bite. He is the backbone of Twitter. He is the reason we have the word ‘meme’. Like the Braveheart, he creates signs to convey feelings. Sometimes the Troll is faceless. And sometimes the Troll is named Bob Miller. The most important thing to remember is, if you’re going to wear the crown of Troll, you have to be ready to take it as quickly as you dish it out. @LAKings glad we could give back. We are always willing to help the less fortunate. We have 3 cups tweet us when you do too. For this last section, I borrow the story of my Favorite Sharks Fan who, appropriately enough, trolls me all season long. “I was a man without country, growing up in a part of the US where hockey wasn’t very popular and we didn’t have a local NHL team. Obviously there were teams and players that I preferred, but it’s hard to develop a good relationship with a team when you can’t go to games, when it’s hard to find them on TV, and nobody around you cares about them. “I grew up playing hockey and sometimes my dad would go to the Bay area and take clients to Sharks games. He’d send me pictures from his awesome seats, save me the rally towels, etc. “I was moving to the Bay for grad school and I was excited to have a local NHL team in the Sharks, a team that had always had a soft spot in my heart and a team I already sort of liked. Even though California isn’t the best hockey market, I was impressed by the loyalty of the fan base. I wasn’t expecting to see signs and flags and shirts and bumper stickers as often as I did. It made me happy. And it made it easy to go all in. The Pilgrim forges his own path, blazes his own trail. Not all of us are born into regional privilege with a team to automatically cling to. My Favorite Sharks Fan could have easily jumped on board with the Blackhawks or the Bruins or the Penguins as so many geographically anemic hockey fans do every day. No, he chose the eternally disappointing difficult path, he chose the Sharks. So which fan are you? I’d like to know. Tweet at me with your answer and any explanation you’d like to include. And lastly, if you think you’re not a short, ugly, wart-faced Troll at heart, you’re doing it wrong. After hearing a female Kings fan shriek, “C’mon Kopi, make a goal!” in 2010, Shawnze rolled up her sleeves and set out to rebrand the notion of lady hockey fan in the streets and Late Romantic Era classical music devotee in the sheets. She has a Masters Degree in Sports Management (no really, it’s a thing) which means she’s really good at paying for things she’ll never use, and credits her dad’s lucky red shorts (and Trevor Lewis) for the success of the Kings’ Cup run in 2012. You can follow Shawnze Kopitar on Twitter @ShawnzeKopitar. Can ex-players have their own section? Because honestly sometimes I feel like I’m the only one boring the people around me with my praise of a perfectly executed Carter-Toffoli-Lucic forecheck/cycle sequence or listing reasons why Anze Kopitar’s backcheck is so effective.